My bathroom shower and bath are the bane of my existence! It never seems to be fully clean! Do you suggest making the shower/bath part of the swish and swipe? What are some things you use for your bath/shower! Swish and Swipe keeps our bathrooms clean. The quick answer to keeping your shower clean is to clean while you are in the shower. The soap that washes your body is the same film that coats the walls and doors of your shower. Some people have just used a purple rag or a nylon net bathtub puff to clean the walls. Keep in mind that your shower did not get dirty over night and it is not going to get cleaned in one day. If you want to stop mildew and mold from growing in your shower; you need to get the air moving. I was taught by a nurse that mold will not grow in moving air. Get a small fan and set it outside your bathroom to blow air into your bathroom. Also open the shower door or pull back the shower curtain. This will help the shower to dry. After the walls dry you will need to close the shower curtain for it to dry. I like to use a cloth curtain. It breathes. I like to bless my sweet darling by cleaning his shower for him once a month. Since we got the Rubba Swishas, I like to use one on corners and floor. I don’t use the same one that I use on his toilet. That would just gross me out! Robert is really good about keeping his shower door open to allow it to dry. You can clean your shower just a little each time you are in it. While the conditioner is on your hair, you can scrub a little area in your shower. After about a week of doing just a little every day your shower will clean and shiny. Kathy use our FlyLady Mop on their showers and bathtubs. They set the handle in its shortest position. You can use it wet to scrub the walls or dry to soak up the moisture. You also use the Rubba Sweepa squeegee side to wipe down the walls. I keep a Rubba Scrubba in my tub. I rarely take a shower since I love my bath time. My Rubba Scrubba helps me keep my tub jets clean. It hangs on a hook. My favorite cleaner for my tub and shower is the same stuff I use on my hair and body. It will really work on the soap scum it makes. Soap is soap! To help eliminate mold and mildew I like to use a very mild solution of bleach water in a spray bottle. The recipe is 1 part bleach to 10 parts water. This will help to keep the mold and mildew from growing. With my Rubba Swisha, Rubba Scrubba, and our FlyLady Mop; we keep our showers clean! Purple Rags wipe down my mirrors and sink. Together my bathroom is company ready! I love how it blesses me! We have a package to fit your needs. 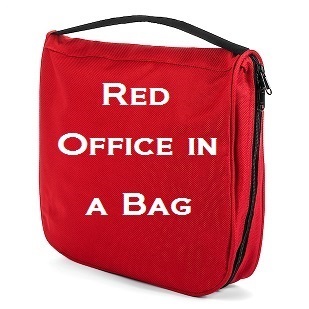 All colors of our Office in a Bag are Half Price! You can get it with the our Control Journal and without out! Now is your chance to save big and get what you need to control your paper clutter. You are not going to believe this price. Only $16.47 with Control Journal and $9.95 for the Office in a Bag alone. All you have to do is add a 1 inch three ring binder and you are set! I know you have one of those in your paper clutter. We have some great tools to help you get your home and car ship shape! You might even have a little fun in the process. If you make it fun it will get done. Use Coupon Code SCRUB640 to save on items that are not already on deep discounts. Our Complete Cleaning System is everything you need to keep your home shining! This entry was posted in Ask FlyLady and tagged ask flylady, bathroom, flylady, get organized. Bookmark the permalink.